Learn more about Floor Lamps by Watching a Video! Modern floor lamps can be bold and architectural, defining a space—but they can also blend seamlessly into the décor, adding a subtle touch of style and elegance. Whether you’re looking to make a statement or merely want to accent your modern décor theme, our expansive selection of sophisticated floor lamps is sure to please. Floor lamps never go out of style. They are trendy, compact and offer the best illumination experience. A well-placed floor lamp can do wonders to your interior. Apart from making a style statement, it can illuminate dark corners. Floor lamps can add light to any space - dining room, living room, bedroom, bathroom and even balconies, porch and verandah. It creates a useful focal point illuminating a darkened corner or highlighting a feature of the house. 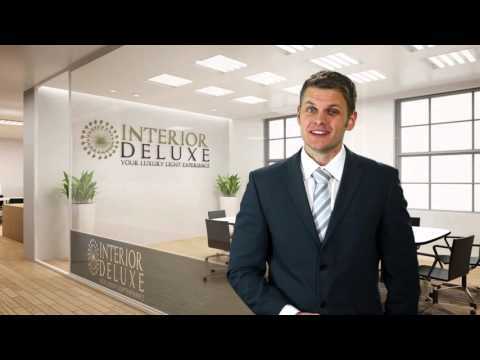 At Interior-Deluxe, we believe in delivering the best quality products for our customers. That’s why we stock only the most well-renowned designer brands >Akari >Alma Light >Almerich >Anton Angeli >Artemide >Estiluz and many others. Our extensive collection of floor lamps has offerings in different colors, sizes, and shapes. You can find Abstract, Conical, Curved, Cylindrical, Drum, Globe, and Rectangle shaped floor lamps, all who are look spectacularly graceful and elegant. You can find different types of floor lamps including Incandescent, Halogen, Fluorescent, and LED. The floor lamps are available here in every imaginable category – Reading floor lamps, Swingarm floor lamps, Arc floor lamps, Torchieres with Reading lights, Multi arm floor lamps, Ambient Floor Lamps, and Floor lamps with LED. For a lightweight solution to illuminate the rooms in style, Swingarm floor lamps are best. The stylish lamps allow you to light any space and corner in the house. Some of the finest examples of this type of floor lamps include BL3M Floor Lamp from Gubi, Floor lamp 2505/2 from Holtkotter, and 6317 Original Halogen Pharmacy Lamp from Holtkotter. Reading floor lamps are, as the name clearly suggests, perfect for providing just the right amount of light so you can easily read a book while sitting comfortably on a sofa or chair. These lamps feature adjustable arm that you can adjust as required. Some of the most popular Reading floor lamps that you can find in our collection include the Pollo floor lamp from Domus, Jackson Floor Light from Delightfull, and Mia Floor Lamp from Carpyen. Ambient floor lamps provide spectacular illumination for your home décor. These lights are ideal for creating an ambiance that delights the senses and captures the imagination. The Cortina floor lamp from Pablo Designs is the finest example of ambient floor lamps that feature architectural simplicity and elegance. The halogen floor lamp is available in multiple sizes including small, medium, and large. Another excellent example of ambient floor lamps is Pablo Design’s Elise floor lamp. This floor lamp looks elegantly refined and features towering frosted diffuser and an aluminum base. It comes with a full range of dimming capacity that can be set as per the mood. Melampo floor lamp from Artemide is yet another great ambient arc lamp, featuring an elegant design done by Andre Gardere for Artemide. This modern lamp features an adjustable diffuser. Its exquisite finishing makes it ideal for modern home and office décor. You can adjust the floor lamp full upward or 35-degree upward position according to your preferences. Arc floor lamps are ideal for a diverse array of spaces such as living room seating, work desks, reading areas, and even art studios. These lights blend in with almost any home or office décor. Our collection of Arc floor features a high-quality finishing and modern design. Popular examples of arc floor lamps include the P-2718 Miris floor lamp from Estiluz, Ibis Floor Lamp - Black Shade from Schuller, and 2211 Floor Lamp from ITALAMP. Floor lamps with LED are in high demand today due to the trend of green and efficient energy usage. Our designer LED lights can complement any modern settings. You can find elegantly designed LED floor lamps made by prestigious manufacturers. Wa Wa Terra Flex LED floor lamp from Catellani & Smith is one of our most popular LED floor lamp that feature great design and style. This floor lamp has a base and structure made of a nickel plated metal that looks elegant and luxurious in any room. Illumination is provided by different LED color temperatures including neutral, cool white, and warm white. This sturdy and stylish floor lamp is dimmable that you can adjust according to your liking. If you fancy light and mobile floor lamp, then Topolino LED floor lamp from Baltensweiler will fit your bill. This floor lamp comes with telescoping action that provides stunning illumination. The fixture also comes with a dimmable transformer while the height and direction of the LED floor lamp is adjustable. As a result, it can serve as a perfect lighting for reading and work. Another favorite LED floor lamp that features a dimmer is the Take Plus 02/03 Floor Lamp from Lumen Center Italia. The elegantly designed floor lamp is available in matt white and chrome finishing. If you like something a little more futuristic, then you should consider Ringlo LED Floor Lamp from Sonneman. This trendy and popular floor lamp looks extraordinary and elegant. The cantilevered stem of the LED light is directed upward through a tapered ring of LED illumination. Overall, it boasts a minimalistic simplicity that can complement modern home décor perfectly. Torchieres can serve your reading, uplighting, and downlighting needs well. You can find an extensive range of Torchieres that feature slim and elegant design. The best Torchieres lighting that you can find in our collection includes Diogenes floor lamp from BELUX, which been voted as the top 10 light for readers. It features a freely movable light source that you can adjust as per the mood and setting. The elegant looking floor lamp has a versatile use and is ideal for both reading and general lighting. Still not sure which Floor Lamps to buy?